We attended last month’s PRSA’s “Rise of the Influencer” luncheon where, our team learned some key components of influencers, including where to find them, how to build relationships and tips on how to work together to efficiently promote a product or service for a client. We want to pass some of these tips to you! An influencer can be a celebrity, political figure or a blogger with thousands or even millions of social media followers. These influencers promote and can even persuade followers to buy a product, follow a company, or use a new app or service by showing the follower their experience with it. Today’s influencer is that trusted friend, and nine out of 10 consumers use recommendations from family and friends. According to an article from Ion, 92 percent of people trust recommendations from an individual even if it’s someone they don’t know. Ion, also states that 74 percent of consumers use social media to make purchase decisions. With these statistics in mind, we understand that consumers trust influencers on social media about a product or service before purchasing it. 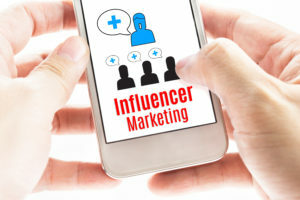 Influencers can be found simply by purchasing a list from a website or searching on Google, reviewing a person’s follower count and looking at their viewer engagement. It’s important to watch what they post and who is responding to their posts, as you want to make sure the products and services they promote relate to your client. For example, if you pick an influencer who normally promotes baby products to now promote a car product, their followers will most likely not purchase the product, as it is out of their normal score of recommendations. You also want to create a relationship with influencers and make sure they are credible and reliable, and most importantly follow FTC guidelines. References: All influencers should be able to give you a reference from other industries, companies and brands they have worked with. This helps you better understand their credibility. Receipts: Ask influencers to show you proof of why they should be paid the amount they request. If an influencer asks for $100 a blog post, they need to show you why it is worth that amount. ROI: After getting answers to the first two “Rs”, you’ll want to create analytics to show your client a return on their investments – be it clicks, engagements or followers. Blog posts – Ask your influencer to share their blog posts about a service or product on other forms of social media and track the posts’ engagements, likes, comments and shares. Instagram – Include a coupon or QR code in a post’s caption and track how many people use the code. YouTube – Provide a link to a website with the video and track how many people visit the website through that link. Thanks to the speakers at the luncheon, Danica Kombal, president of Everywhere Agency, Dawn Brun, director of communications – Cardlytics, Dwayna Haley, vice president – Porter Novelli and Tracey Del Moral, director of marketing – Carter’s/OshKosh B’gosh for sharing their experiences.